That throned in light and bliss, we too may reign above. 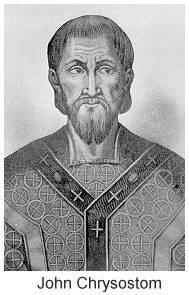 Note: Matthias by tradition "preached the Gospel for more than 30 years in Judea, Cappadocia, Egypt and Ethiopia. Remembered for preaching the need for mortification of the flesh with regard to all its sensual and irregular desires. Martyr. Died stoned to death at Colchis in 80 AD; some relics in the abatical church of Triers, others in Saint Mary Major in Rome"
And there came a man of God unto Eli, and said unto him, Thus saith the LORD, Did I plainly appear unto the house of thy father, when they were in Egypt in Pharaoh's house? And did I choose him out of all the tribes of Israel to be my priest, to offer upon mine altar, to burn incense, to wear an ephod before me? and did I give unto the house of thy father all the offerings made by fire of the children of Israel? Wherefore kick ye at my sacrifice and at mine offering, which I have commanded in my habitation; and honourest thy sons above me, to make yourselves fat with the chiefest of all the offerings of Israel my people? Wherefore the LORD God of Israel saith, I said indeed that thy house, and the house of thy father, should walk before me for ever: but now the LORD saith, Be it far from me; for them that honour me I will honour, and they that despise me shall be lightly esteemed. Behold, the days come, that I will cut off thine arm, and the arm of thy father's house, that there shall not be an old man in thine house. And thou shalt see an enemy in my habitation, in all the wealth which God shall give Israel: and there shall not be an old man in thine house for ever. And the man of thine, whom I shall not cut off from mine altar, shall be to consume thine eyes, and to grieve thine heart: and all the increase of thine house shall die in the flower of their age. And this shall be a sign unto thee, that shall come upon thy two sons, on Hophni and Phinehas; in one day they shall die both of them. And I will raise me up a faithful priest, that shall do according to that which is in mine heart and in my mind: and I will build him a sure house; and he shall walk before mine anointed for ever. IN those days Peter stood up in the midst of the disciples, and said, (the number of names together were about an hundred and twenty,) Men and brethren, this scripture must needs have been fulfilled, which the Holy Ghost by the mouth of David spake before concerning Judas, which was guide to them that took Jesus. For he was numbered with us, and had obtained part of this ministry. Now this man purchased a field with the reward of iniquity; and falling headlong, he burst asunder in the midst, and all his bowels gushed out. And it was known unto all the dwellers at Jerusalem; insomuch as that field is called in their proper tongue, Aceldama, that is to say, The field of blood. For it is written in the book of Psalms, Let his habitation be desolate, and let no man dwell therein: and his bishoprick let another take. Wherefore of these men which have companied with us all the time that the Lord Jesus went in and out among us, beginning from the baptism of John, unto that same day that he was taken up from us, must one be ordained to be a witness with us of his resurrection. And they appointed two, Joseph called Barsabas, who was sur-named Justus, and Matthias. And they prayed, and said, Thou, Lord, which knowest the hearts of all men, shew whether of these two thou hast chosen, that he may take part of this ministry and apostleship, from which Judas by transgression fell, that he might go to his own place. And they gave forth their lots; and the lot fell upon Matthias; and he was numbered with the eleven apostles. "Peter stood up in the midst of the disciples, and said." Why did he not ask Christ to give him some one in the room of Judas? It is better as it is. For in the first place, they were engaged in other things; secondly, of Christ’s presence with them, the greatest proof that could be given was this: as He had chosen when He was among them, so did He now being absent. Now this was no small matter for their consolation. But observe how Peter does everything with the common consent; nothing imperiously. And he does not speak thus without a meaning. But observe how he consoles them concerning what had passed. In fact, what had happened had caused them no small consternation. For if there are many now who canvass this circumstance, what may we suppose they had to say then? “Men and brethren,” says Peter. For if the Lord called them brethren, much more may he. [“Men,” he says]: they all being present. See the dignity of the Church, the angelic condition! No distinction there, “neither male nor female.” I would that the Churches were such now! None there had his mind full of some worldly matter, none was anxiously thinking about household concerns. Such a benefit are temptations, such the advantage of afflictions! He gives his discourse a moral turn, and covertly mentions the cause of the wickedness, because it carried reproof with it. And he does not say, The Jews, but, “this man, acquired” it. For since the minds of weak persons do not attend to things future, as they do to things present, he discourses of the immediate punishment inflicted. “And falling headlong, he burst asunder in the midst.” He does well to dilate not upon the sin, but upon the punishment. “And,” he says, “all his bowels gushed out.” This brought them consolation. “And it was known unto all the dwellers at Jerusalem; insomuch as that field is called in their proper tongue Aceldama, that is to say, the field of blood.”. Now the Jews gave it this name, not on this account, but because of Judas; here, however, Peter makes it to have this reference, and when he brings forward the adversaries as witnesses, both by the fact that they named it, and by saying, “in their proper tongue,” this is what he means. Why does he make it their business too? That the matter might not become an object of strife, and they might not fall into contention about it. For if the Apostles themselves once did this, much more might those. This he ever avoids. Wherefore at the beginning he said, “Men and brethren. It behooves” to choose from among you. He defers the decision to the whole body, thereby both making the elected objects of reverence and himself keeping clear of all invidiousness with regard to the rest. For such occasions always give rise to great evils. Now that some one must needs be appointed, he adduces the prophet as witness: but from among what persons: “Of these,” he says, “which have companied with us all the time.” To have said, the worthy must present themselves, would have been to insult the others; but now he refers the matter to length of time; for he says not simply, “These who have companied with us,” but, “all the time that the Lord Jesus went in and out among us, beginning from the baptism of John unto that same day that He was taken up from us, must one be ordained to be a witness with us of His resurrection” : that their college might not be left mutilated. Then why did it not rest with Peter to make the election himself: what was the motive? This; that he might not seem to bestow it of favor. And besides, he was not yet endowed with the spirit. “And they appointed two, Joseph called Barsabus, who was surnamed Justus, and Matthias.” Not he appointed them: but it was he that introduced the proposition to that effect, at the same time pointing out that even this was not his own, but from old time by prophecy; so that he acted as expositor, not as preceptor. 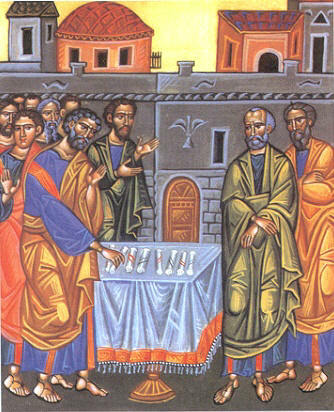 “Joseph called Barsabus, who was surnamed Justus.” Perhaps both names are given, because there were others of the same name, for among the Apostles also there were several names alike; as James, and James (the son) of Alphæus; Simon Peter, and Simon Zelotes; Judas (the brother) of James, and Judas Iscariot. The appellation, however, may have arisen from a change of life, and very likely also of the moral character.